Once again Les Deux Alpes is holding its ski and snowboard Mondial with the focus this year on making gear tests more efficient and enjoyable. 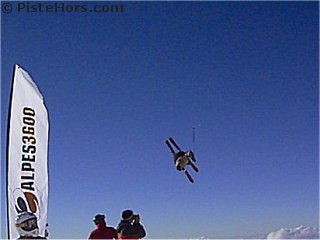 One of the big complaints of previous Mondials was the time taken to get skis or boards and take them for a turn on Les Deux Alpes stunning glacier situated between 3200 and 3600 meters. Responding to this the test village will be a closed area with computerized equipment loans and a priority lift for testers. The 16th Snowboard Mondial will be run over the long weekend of the 22nd to 24th October and the 8th Ski Mondial from the 29th to 31st of October. 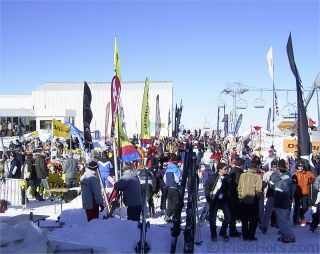 The organisers say it is the only opportunity to test the latest 2005-2006 winter sports gear including skis, snowboards, accessories and clothes in Europe. All that included in the day ski pass cost of 23.5 €. Boarders and skiers will also have access to experts representing more than 80 of the top brands in winter sports. The village at 1650 meters will host a video festival dedicated to sking and snowboarding including foreign films, premières and brand movies. Some famous riders will be present including world class locals Gary Zebrowski (winner of the 2005 half pipe world cup in snowboard at Tandadalen, competing for 2006 Torino Olympics) and Matthias Wecxsteen (gold medal at the 2005 half pipe world championships in ski at Ruka). The traditional skate ramp has been replaced by a freestyle night show with kickers, rails and a large demonstration surface. At 3400 meters high up on the glacier riders will find the the snowpark, reputed as one of the best in Europe. Its 2 half pipes, slopestyle zone and a succession of hand rails, as well as its kickers, big air and hips are accessible to anyone who wants to have a go. The Mondial du Ski’s jewel in the crown is the Saab Salomon Crossmax Series, a qualifying stage for the mythical American competition, the X Games, which is held October 28th and 29th.